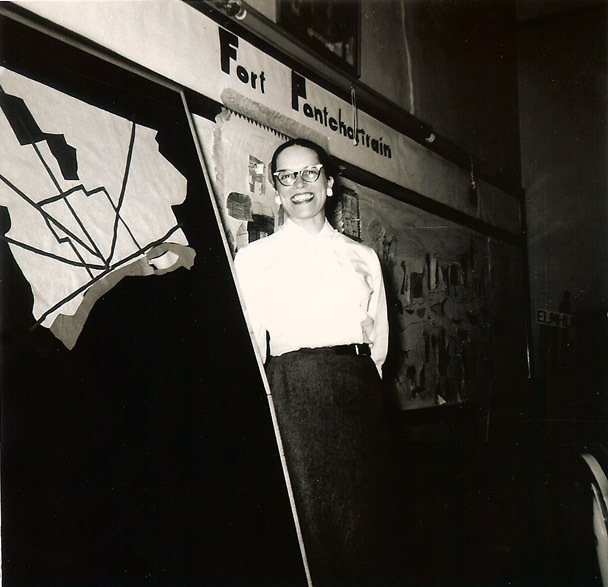 Doris Graham Cleage in her classroom at Roosevelt Elementary School – 1959. 36 years old. My mother was 36 years old and had been teaching for six years at Roosevelt Elementary school when it was taken. My sister and I attended Roosevelt. I had my mother for a Social Studies teacher when she first began teaching. We pretty much read the book, “Someday Soon.” and answered questions. It was not very interesting. She improved a LOT as she went through twenty years of teaching. Her last teaching assignment was at Duffield Elementary school, where she taught reading using the Distar method. She loved it and taught it to me and I used it to teach all of my children to read. 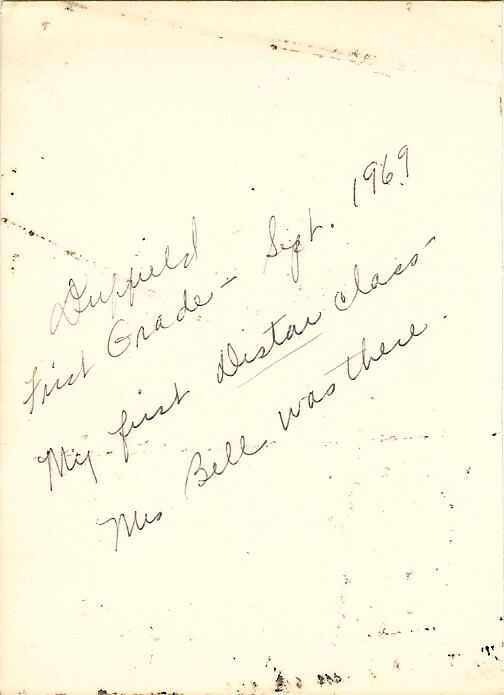 I found the writing below in one of my mother’s notebooks. It isn’t dated and I don’t know if she wrote it after retirement or before or what she was planning to do with it. Each year when school begins I see again the many ways in which my children are alike. I am equally impressed with their differences. Close on the heels of these feelings comes the realization that once more I must try to build with each child the kind of relationships that will make it possible for me to teach him. Children ask themselves many questions about a new adult. Is she friendly? does she smile often? Does she really mean what she says? What does she expect of me? Too much? Too little? Can I be myself with her? Or must I pretend to be what she has already decided I must be? Will she listen when I am happy or in trouble or need help? Or will she always be too busy? Satisfactory answers to these questions will mean satisfactory learning experiences for a child. Unsatisfactory answers will mean no learning – or even worse the learning of things that must later be unlearned. It was a warm afternoon. The sounds of children at play came in through our open windows along with the good smell of newly cut grass. My forty odd second-graders, (who come to me for two distressingly brief forty minute periods each week), were eagerly writing with crayons on small pieces of lined paper. Rough desks and clumsy crayons made writing difficult, but they settled to their pleasant task of writing for me their first and second choice for group work. We had been studying transportation as groups. Now according to our plan, we were dividing ourselves into groups of seven or eight to paint, draw write plays, poems, or stories, or create in clay about airplanes, boats, subways, cars or trains – whatever appealed the most to us. We had decided to use crayons instead of pencils because it took less time to pass crayons from a large box than it took to pass each one his own pencil. His hands did not move as he stared as his paper. Work had stopped and forty pairs of eyes watched us unwaveringly. Here was a child who brought to school a brilliant mind (At 7 he could read on a fifth-grade level) burdened by countless problems at home – over-worked parents building a small business, a senile grandmother, constant competition for recognition and affection with her as well as with older and younger brothers. “I don’t care – but not this one! He opened his fist and showed a purple crayon moist from a small hand’s clenching. He took it without a word and began to write his choices. I looked over his head at the children. They smiled gently and I smiled back. We had taken another step on the road to good learning. The inspiration for this post came from reading “Fearless Females Blog Post: March 12: Working Girl” on the blog The Accidental Genealogist. I’m working to remove very, truly, really, and so from my writing. To strip it down. Beautiful post. She was a teacher. I agree with Susan, this is an absolutely beautiful post. Thank you both! I’m glad I posted it. Took my breath away! Every line, took my breath away! She was a perfect teacher. And Mrs. Cleage taught me 6th grade English at Chrysler elementary school. I do remember her having so many in- class spelling bees I learned to spell. Fun or what! And now you are a writer! Wow, your mother must have been an awesome teacher. It is wonderful how she reflected on her teaching and thought about how to best meet the needs of individual students. 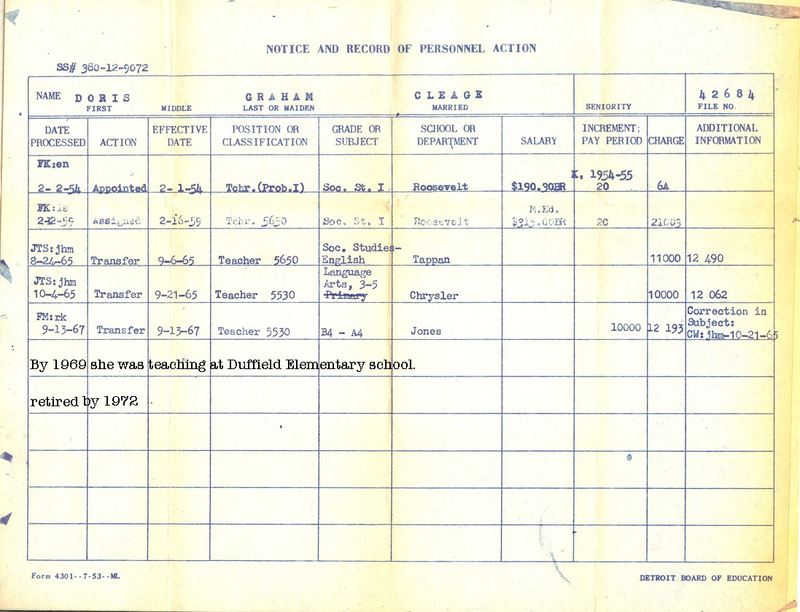 An aside–Teachers weren’t paid very much in the 1950’s. There’s been inflation–but $190 and $315 (per month?) looks really low. This includes all of michigan. Perhaps the amounts on the chart were bi-weekly. The lowest being her beginning salary and going up after she completed her masters. nice story, in your story! Glad you read it Ellen! Hope the mechanic doesn’t make you wait!! An amazing educator. Beautiful post! Thanks for sharing. Your mother was a loving, caring teacher. Julie probably remember your mother for years. What an absolutely wonderful post. How extraordinary it must have been to have a teacher such as your mother, who thought about each child’s questions and needs in so wholistic and caring a manner. I see how you and your sister came to be such special human beings. You did not fall far from the tree. Reading this, I had a sense of such fullness, such tenderness even. How I wish there were more teachers like your mother. This is a beautiful post. As A.L. says, you didn’t fall far from the tree. In a former life I was married to a life-long elementary teacher (3rd and 4th graders). I saw how “real teachers” devote themselves to their children — and to their profession. Your mother is a perfect example of that. I thoroughly enjoyed the history you shared of your growth as well as your family. I was drawn to it in an effort to understand what things, ie. social, economic, political, family, religious, influence his life and may have impacted the choices he made to establish the shrine. Thanks so much for sharing!!!! I was speaking of Jaramogi (Albert Cleage, Jr.. I failed to mention his name in the above comment. Thanks again for sharing!!!! Ahdwele, I’m glad you found it helpful in understanding.